Abraham Maslow (1908-1970)determined that, like behaviour and natural intelligences, what motivates you is unique to you and is a combination of your natural motivations and your current lot-in-life. He developed the Hierarchy of Needs Motivational Model back in the 1940’s – yes it’s old, but still valid in today’s society. Biological and Physiological needs – basic survival needs of food, water, shelter, warmth, sleep, health and air. Safety needs – security, order, law, limits, stability, protection from elements, etc. Social needs – love, family, affection, relationships, friends, work group, etc. Esteem needs – achievement, independence, status, prestige, responsibility, etc. Self-Actualization needs – personal growth, self-fulfillment, realising personal potential, seeking knowledge and meaning, etc. Think about you and your life as it is at the moment. I’m sure you’ll relate to the 5 motivational needs developed by Maslow and obviously you'll have a need to maintain the ‘lower’ level needs, even if you are mostly at Level 4 or 5. 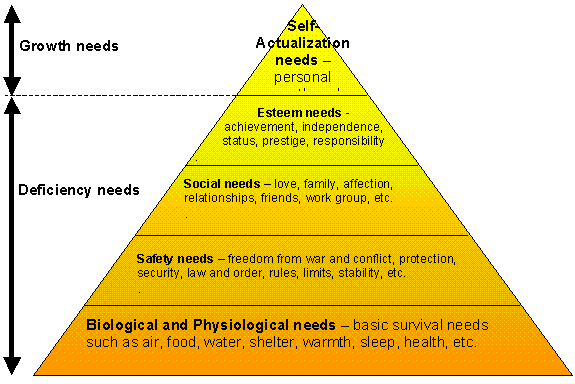 Ignoring the need to maintain these lower level needs, which level do you think you are mostly focused on? Are there any specific needs you have in any of the other levels? What concerns/ deficiencies do you think you have in these levels? Achievement motivated - Achievement motivated people love the thrill of reaching challenging goals. They need a sense of accomplishment and need feedback on their progress towards their goals. ‘Peacocks’ are typically motivated by achievement, and so can ‘Owls’. Authority motivated - Authority motivated people love being in control, influential leading and personal status/ prestige. They need to feed their egos on their progress towards their goals. ‘Eagles’ are typically motivated by authority. Affiliation motivated - Affiliation motivated people love interaction with other people and need to be liked/ popular. They achieve their goals in a team environment. ‘Doves’ are typically motivated by affiliation, and so can ‘Peacocks’. Of these motivators, the ‘achievement’ motivated person is probably the most balanced and most likely to get results from goal setting – the authority motivated person often puts ego first and the affiliation motivated person often puts personal popularity or other people’s needs first – in both cases, they can lose sight of the big picture. What motivates you – achievement, authority or affiliation? I’ll give you an example. The motivation to have a roof over your head is driven by the most basic biological/ survival need. The motivation to get a house in a better part of town with a lower crime rate is driven by the need to feel safe, the BBQ for entertaining and extra bedrooms for a family is a social need and the motivation to have a bigger and better house is driven by self-esteem needs. Of course, your self-actualisation motivations then tell you that having a bigger and better house doesn’t fundamentally change who you are! It is interesting that the smallest part of the triangle – represented by self-actualisation needs – is not the least important, it’s just the last level of motivation that is traditionally achieved and the first to disappear if your life takes a turn. Unfortunately it's also getting harder to get to 'Level 5' due to the pressures of modern day living - see the 'warning on consumerism' under the 'Success Secrets' tab on the NavBar to find out more]. Maslow’s hierarchy implies that the lower-end needs must to be mostly satisfied before the higher needs influence your motivation. In other words, if you are struggling to put food on the table, you probably won’t really be interested in learning a new language or musical instrument for self-fulfilment. Of course it’s not as simple as that. Like all of the other models we’ve looked at, you will have a dominant Maslow level but still have motivational needs at the other levels. For example, if you are in Level 4 or 5, you still need to eat (biological need) and will still be seeking friendship (social need) and things like house insurance (a safety need). In other words, all levels of Maslow’s motivational needs have to be maintained for the right life balance. Maslow’s model does however help you target areas for your goal setting, by identifying potential ‘road-blocks’ in the lower levels that are preventing you from achieving higher level needs. The process of goal setting is typically motivated by Level 4/5 needs, although you may also be utilising the process to address some aspects of the lower needs, such as quitting smoking (which is essentially a health need driven by biological motivators).